I was sure Super Crop Challenge #6 would be a win for the house, but Troy Bartlett scored an impressive points sweep by correctly deducing that the structures shown were the spines of an early instar caterpillar of “something akin to a hickory horned devil (Citheronia regalis).” I found this caterpillar feeding on the foliage of a small tree in the Ciudad Universitaria (Distrito Barão Geraldo) area of Campinas, Brazil last January. I must confess that I spent considerable time trying to identify it myself before I finally threw in the towel and called on the experts for help. The spines made me think it must be some kind of nymphalid butterfly larva, although I had never seen such “fly swatter” clubs at the ends of the spines, so I sent the photo to Phillip Koenig, a local butterfly expert who has collected extensively in Ecuador. He, too, was puzzled and forwarded the photo to Charley Eiseman, who himself didn’t know what to make of it and forwarded it on to Keith Wolfe, a lepidopterist who specializes in butterfly immatures. After stumping his Brazilian contacts, Keith had the idea that perhaps it wasn’t a late-instar larva—as we all had assumed (this larva was a good 15–20 mm in length), but rather one in an early stadium. A quick search of several standard websites revealed this to be the L1 or L2 larva of a species of Citheronia (Saturniidae, Ceratocampinae). To support his ID, he provided links to larval photos of C. splendens (Arizona) and C. lobesis (Central America). The L1 larva of both of these species bears the same “fly swatter” spines, and the latter is remarkably similar in color pattern as well. In trying to determine what species of Citheronia occur in southeast Brazil, I came across this link with photos of a caterpillar from southern Brazil—the L1 looking nearly identical—that was eventually identified as the common Brazilian species C. laocoon. Troy suggested C. brissotii—another good possibility as that species is found from southeastern Brazil through Uruguay to Argentina. However, in perusing a number of online sources, it appears there are several other species of Citheronia that also occur in Brazil, so a species ID for the larva in this photo may not be possible. Troy’s win vaults him into 3rd place in the current session overalls, but steady Tim Eisele took 2nd place with 6 pts and takes over the session lead. Newcomer Roy rounds out the podium in 3rd place with 5 points. Dave’s pity points are nothing to sneeze at, as they helped him retain sole possession of 2nd place in the overall standings (let that be a lesson to those who don’t play because they’re “stumped”!). There will be at least two more challenges in the current session before a winner is crowned, so look for an opportunity to shake up the standings in the near future. This entry was posted in Lepidoptera, Saturniidae and tagged Brazil, Brazil Bugs, entomology, immatures, insects, moths, nature, quiz, royal moths, science, Super Crop Challenge. Bookmark the permalink. Oh, those Lepidoptera. As if it isn’t enough that the larvae and adults don’t look anything alike, some of them have to go and complicate ID still further by making the young larvae look radically different from the old larvae! I guess it shouldn’t be surprising that different instars face different selection pressures that can result in different appearances. I’ve just never seen an example where the differences between young and old are as striking as this. We have some of the same thing here. 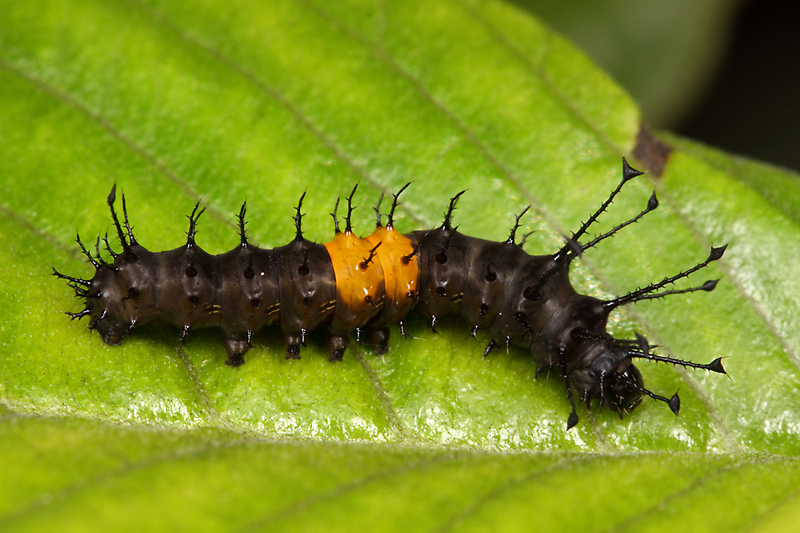 For example in this very genus, we have the “hickory horned devil” for the larval stage of Citheronia regalis and “royal walnut moth” for the adult. In many other cases, both the adult and larva are known by a common name that obviously refers in some manner only to the larvae—e.g., tomato hornworm (the adult is rarely seen on tomato, does not have “horns” and looks very little like a worm). All the more reason to become comfortable with scientific names.